Linda Dickerson Retires from Strongwell after 27 Years! 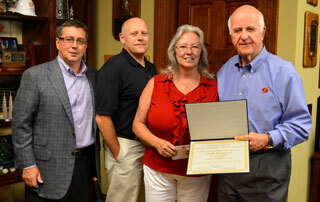 Linda Dickerson (Pultrusion-Bristol) was honored on June 27th, in celebration of her retirement from Strongwell. Linda was with Strongwell for over 27 years. During her tenure, Linda worked in both fabrication and pultrusion capacities through shop order data entries, pultrusion production and sample fulfillment. Her retirement plan consists of spending time with her trove of grandchildren, continuing her newfound exploration of kayaking and perfecting her quilting craftsmanship. Strongwell congratulates and thanks Linda for her hard work and dedication over the years.